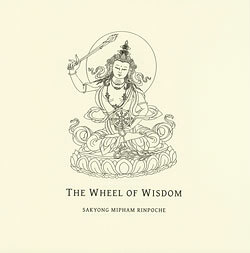 Available to students who have received the reading transmission and who have completed Shambhala Vajrayana Seminary. This supplication to Manjushri, the embodiment of wisdom, was composed by Sakyong Mipham Rinpoche in 2001. The practice helps remove inhibitions and obstacles to the speech principle. Its purpose is to help deepen and "understand the profound inner meanings of sutra and tantra." Recommended for practice before studying, teaching, or participating in a discussion group.